Many Americans avoid the oral health care they need because of fear or anxiety surrounding dental treatment. Previously traumatic experiences, the sounds and smells of a dental office and fear of pain are commonly cited as reasons why some people feel fearful or anxious about dental treatment. As leading Oklahoma City dentists, Drs. Jennifer and Cory Chambers of Cobblestone Park Family Dental are trained to care for nervous or fearful patients. 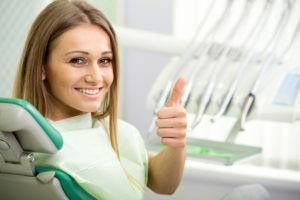 If you feel anxious about dental treatment, read on as the dentists offer some of our best tips to make treatment a calm and comfortable experience. If you feel nervous or fearful about dental treatment, select an appointment time that is not likely to cause you stress. You don’t want to feel rushed or pressured. We will do our best to work around your schedule. Depending on the particulars of your daily schedule, your appointment could be at the beginning or end of the week, or our first or last timeslot of the day. Prior to your appointment, watch what you consume. Avoid sugar and caffeinated foods and beverages, which can worsen anxiety and nerves. Instead, try a calming cup of tea for a soothing effect. If our team knows about your nerves or anxiety surrounding dental treatment, we can tailor our care to help you relax and feel more comfortable. Let us know prior to your appointment what you are feeling, and we will adapt our approach as needed. It may be calming to you to understand the work that is being performed, so we will explain your entire procedure ahead of time and then walk you through the process step-by-step. You can also decide on a special hand signal that indicates you would like to pause in the middle of treatment and take a break. Certain medications, like nitrous oxide or sedation medications, can soothe your nerves and anxiety and make treatment a stress-free experience. Feel free to inquire about our medication options prior to your appointment. The more regularly you see us for routine exams and cleanings, the more likely you are to feel comfortable in our care. Try to get into the habit of seeing us every six months for basic services (or more frequently as recommended). To book an appointment with our caring dentists, please call (405) 603-8520 or email Cobblestone Park Family Dental today.